Have you ever wondered how your computer knows all the characteristics of your monitor— the supported resolutions, the model, and even the serial number? Most monitors use a system called DDC to communicate this information to the computer.1 This information is transmitted using the I2C communication protocol—a protocol also popular for connecting hobbyist devices. In this post, I look inside a VGA monitor cable, use a tiny PocketBeagle (a single-board computer in the BeagleBone family) to read the I2C data from an LCD monitor, and then analyze this data. Inside a VGA cable. The cable is more complex than I expected, with multiple layers of shields. The green, red, white (sync) and blue wires are thicker and have their own shielding. To connect to the monitor, I cut a VGA cable in half and figured out which wire goes to which pin.3 The wire (above) is constructed in an interesting way, more complicated than I expected. The red, green, blue and horizontal sync signals are transmitted over coaxial-like cables formed by wrapping a wire a spiral of thin copper wires for shielding.2 The remaining signals travel over thinner plain wires. 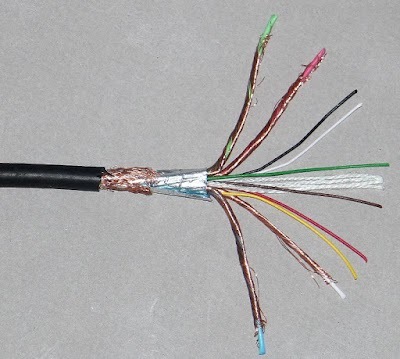 Several strands of string form the structural center of the VGA cable, and the ten internal wires are wrapped in a foil shield and woven outer shield. The photo above shows the male VGA connector on each end of the cable. The function assigned to each pin is shown in the table below. The I2C clock (SCL) and data (SDA) are the important pins for this project. The wire colors are not standardized; they refer to my VGA cable and may be different for a different cable. The 5 volt wire in the cable has a clever purpose. This wire allows the computer to power the EEPROM chip that provides the configuration data. Thus, the computer can query the display's characteristics even if the display is turned off or even unplugged from the wall. To read the data over I2C, I used the PocketBeagle, a tiny Linux computer that I had handy. (You could use a different system that supports I2C, such as the Raspberry Pi, Beaglebone or Arduino.) I simply connected the I2C clock (SCL), data (SDA) and ground wires from the VGA cable to the PocketBeagle's I2C pins as shown below. 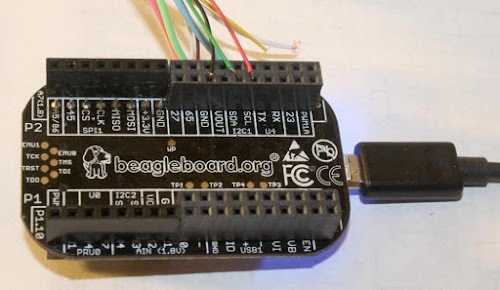 Connecting a VGA cable to the PocketBeagle allows the configuration data to be read over I2C. The black wire is ground, the green wire is I2C data (SDA) and the red wire is I2C clock (SCL). Simple Linux commands let me access I2C. First, I probed the I2C bus to see what devices were present, using the i2cdetect command. (Many devices can be connected to an I2C bus, each assigned a different address.) The output below shows that devices 30, 37, 4a, 4b and 50 responded on I2C bus 1. Device 50 is the relevant I2C device, assigned to the configuration information. Device 37 is DDC/CI, allowing monitor settings to be controlled by the computer, but I'll ignore it for this post. Devices 30, 4a, and 4b are a mystery to me so leave a comment if you know what they are. Next, I used the i2cdump command to read 128 bytes from device 50's registers, providing the raw VGA information. The hex values are on the left and ASCII is on the right. 00: 00 ff ff ff ff ff ff 00 04 69 fa 22 01 01 01 01    ........?i?"???? 40: 45 00 dd 0c 11 00 00 1e 00 00 00 fd 00 32 4c 1e    E.???..?...?.2L? 70: 00 46 34 4c 4d 51 53 31 32 38 35 34 36 0a 00 bb    .F4LMQS128546?.? The configuration data is encoded in the EDID (Extended Display Identification Data) format, so it's not immediately obvious what the data means. But the format is well-documented, so it's not too hard to figure out. For instance, the first 8 bytes 00 ff ff ff ff ff ff 00 are the header. The next two bytes 04 69 encode three 5-bit characters for the manufacturer ID, in this case "ACI" - Asus Computer International. (The data format uses a lot of annoying bit manipulations like these to make the data compact.) Near the end of the output, the ASCII strings "VE228" and "F4LMQS128546" are clearly visible; these are the monitor's model number and serial number. As you can see, the EDID format crams a lot of configuration information into 128 bytes. The output starts off with some basic data about the monitor's characteristics and inputs. The VGA standard doesn't nail down as many things as you'd hope. For instance the sync signals can be provided on one wire (separate), two wires (composite), or on the green wire. The output above shows my monitor supports all three sync types. The monitor then provides a long list of supported resolutions, which is how your computer knows what the monitor supports. The "detailed timing descriptor" provides more information on signal voltage levels and timings. The timing of VGA signals contains some strange features (e.g. blanking and "front porch") inherited from obsolete CRT (Cathode Ray Tube) displays. The values in the configuration provide the information necessary for the computer's graphics board to synthesize a proper VGA signal that the monitor can understand. The CIE chromaticity coordinates provided by the monitor are interesting, but need a bit of background to understand. A CIE chromaticity diagram (below), shows all the colors in the real world. (Brightness is factored out, so grays and browns don't appear.) Individual wavelengths of light (i.e. the spectrum) curve around the outside of the diagram. The colors inside the curve are combinations of the pure spectral colors, with white in the middle. 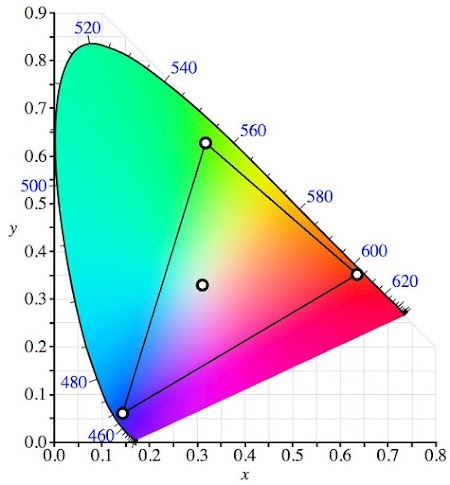 CIE diagram showing the color gamut and white point of my monitor. A display, however, generates its colors by combining red, green, and blue. The result is that a display can only show the colors inside the triangle above with red, green, and blue at the corners. A display doesn't generate the light wavelengths necessary to display colors outside the triangle. Like most monitors, this monitor can only show a surprisingly small fraction of the possible colors. (A wide-gamut display uses different phosphors to expand the triangle and get more vivid colors.) The triangle vertices and white point4 in the diagram above come from the x,y chromaticity coordinates in the configuration data. You might wonder how you can see the whole CIE diagram on your display if only the colors inside the triangle can be displayed. The answer is the diagram "cheats"—the colors are scaled to fit into RGB values, so you're not seeing the exact colors but just an approximate representation. If you look at the spectrum through a prism, for instance, the colors will be more intense than what you see in the CIE diagram. The I2C protocol (Inter-Integrated Circuit) was invented in 1982 by Philips Semiconductor to connect a CPU to peripheral chips inside televisions. It's now a popular protocol for many purposes, including connecting sensors, small LED displays, and other devices to microcontrollers. Many I2C products are available from Adafruit and Sparkfun for instance. I2C trace: clock (SCL) in cyan and data (SDA) in yellow. Green shows decoded data. Oscilloscope was set to 20µs/division and 2V/division. Devices on the I2C bus can only pull a line low; pull-up resistors keeps the lines high by default.7 As a result, the traces above drop low sharply, but climb back up slowly.8 Even though the transitions look sloppy, the I2C bus worked fine. I couldn't find a source to tell me if VGA monitors included pull-up resistors, or if I needed to add them externally. However, I measured voltage on the lines coming from the monitor and everything worked without external resistors, so there must be pull-up resistors inside the monitor. The VGA specification includes a data link that allows a computer to learn about a monitor and configure it appropriately. It is straightforward to read this configuration data using the I2C protocol and a board with an I2C port. While VGA is mostly obsolete now, the same data protocol is used with DVI and HDMI displays. My goal in reading the monitor's config data was so I could use the timing data in an FPGA to generate a VGA video signal. (That project is yet to come.) Follow me on Twitter or RSS to find out about my latest blog posts. > Devices 30, 4a, and 4b are a mystery to me so leave a comment if you know what they are. 0x30 appears to be a paging register to allow access to more than 256 bytes of DDC data. I went through a similar adventure years ago with an old favorite monitor that refused to work right on a 2010 Mac Mini. Resolving the issue required dumping the EDID, doing some hex editing, then reflashing the EDID and was really educational. Probably would've been a great excuse to build one of these types of PocketBeagle/RPi projects! Instead I had to rummage through my "historical hardware" bins to find an (apparently rare) VGA card that'd work with the i2c EDID dump executable I had found, a floppy drive, DOS boot disk, and more fun things to get it going. A bit less fun but it did the trick. Found the article I used for the fix on the Wayback Machine. Was the first time I had ever taken a close look at the world of DCC, EDID and i2c. Never knew that EDID was send over I2C and I had always thought vga did not support it. How interesting thanks for sharing. Windows allows you to access direct i2c data through COM object, and to access the entire I2C mem of the display. A while ago I used it with Excel to get the data from all displays inside the network in the business I worked for, for inventory purposes. The harder part that time was to find lastest EDID specification. But I got it! Worked out nicely! Fun stuff. I worked on the original monitors at IBM that supported DDC1 ...many years ago. The early units had a square box in series on the monitor cable. That is where the micro resided that spit out the DDC1 data stream.